Upper Mustang Trekking | Mustang Trek | EncountersNepal. Feel the thrill of the Himalayas with team of highly experienced trekking professionals. 100% 5 star based on 74 reviews. Upper Mustang is one of those mystical treks that incite the curious trekker who enjoys the much lesser known parts of history & unusual traditions that are perhaps found nowhere else on planet earth. This once flourishing kingdom that was hidden to a very open & free world opened its gates to the curious as early as 1991 by a government that seemly needed some urgent revenue of which some could be poured into the development of this sensitive region in the north east corner of Nepal which borders Tibet, one of the reasons for its restrictions; mustang can be construed as one of the last vestiges of authentic Tibetan culture in its true form. This Trek takes you on unusual trails less tread by others & this is perhaps what you would like about Mustang that falls in the rain shadow zones of Nepal’s diverse climatic landscapes. For trekkers who are interested in the paradigms of society & the traditions practiced, the mustang trip would be ideal learn of a history lesser known. This is a wonderful cultural trek that takes you across arid territory where fossils have been discovered & interactions with the local folks add more zing into your sojourns. the Upper Mustang trails give you vivid backdrops of stunning colors that range from the rugged bronze yellow, grey shadows with a silver lining red rays that can be seen in twilight with the rising of the moonlit that hits the mountains of mustang in fantastic colors that stops the breath for a moment. the erosion of the hillsides by the wind add more western feelings to the grand canyons of the wild west…but more mystifying & interesting than the actual mountains of the USA. The treeless mountain geography & the moraine terraces that disappear are a fantastic journey into Mustang’s unique geography that leaves you baffled. You are cornered by over 35 mountains ranging from 2815 meters to 3780 meters above sea level, leaving the senses stunned by what you behold. Mustang’s Tibetan culture is untouched, virtually, despite the changes come about in nearby Tibet under the shadow of china’s watchful governing policies that seem to be hell bent reforming the true Tibet. The Bonpo culture has not been influenced by any outsiders till date & this is refreshing for the local folks who want it this way. Mustang is aptly snuggled on the borders of Tibet & seemingly protected by the Annapurna giants & the Dhaulagiri range. Geographically based at the tip of the Kali Gandaki, the district of Mustang is culturally and physically attractive for those who enjoy nature of a different kind. Its remoteness presents you an animated medley of earths natural colors—yellows, reds, blues, and browns that give it stunning appearances at different times of the day. Mustang is called 'Lo' in the local jargon & this means 'arid' region. The local people are Lobas. Several hundred years ago, Mustang was a thriving kingdom and was the seat of Buddhist teachings and arts. This kingdom was the known ancient junction for salt trade between Tibet and cities of the Indian subcontinent. 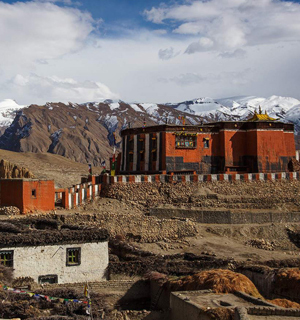 Once a restricted zone, Mustang today allows only 200 trekkers through its gates annually. The Upper Mustang Trek route is a wonderful venture that gives an exceptional opening to the curious trekker; the trek itself is not really taxing to the body but the extreme afternoon winds can be your real challenge because the elevations hereabouts are not much as you would find elsewhere in Nepal. The superb ecological diversity and colorful villages, ancient monasteries, and shining snowy peaks make this a block-buster trip you shouldn’t avoid. The major peaks you get to see during the Upper Mustang trek are Annapurna, Mount Dhaulagiri, Nilgiri, Tilicho Peak, Tukuche Peak, Mustang Himal, Arniko Chuli among many other famous peaks. This ancient kingdom is also home to some of the biggest and oldest Tibetan Buddhist Monasteries, with excellent artwork of its time. Said to be the Last Forbidden Kingdom, mustang had its own king or Tribe Leader called Jigme Palbar Bista, but with the declaration of a Republic Nepal in 2007, the Government took back Bista's official recognition as the Mustangi King, but this had no affect on the Mustangi people who still respect Bista as their rightful leader. Within the heart of Mustang District lies its capital, Lo-Manthang, which is also the district-headquarter. Lo-Manthang is a walled city located at an elevation of about 3800 meters above sea level. Upper Mustang is well known for its inaccessible caves, monasteries, chortens, and rocky desolate landscapes. The length of the city wall and the 4 storey palace in Lo-Manthang coupled with the beautiful architectures are the major attractions of Upper Mustang. The famous Tiji Festival is another crowd puller in this region when the festival commences during the end of the dry season. The distinctive lifestyle of Mustangi people baffles many outsiders. Among some of the traditions is the existence of polyandry. You will be surprised to know that all the brothers of a single family get married to the same girl…& this is Upper Mustang for you as you get to meet some of these families. Be a participant with EncountersNepal for a special trip to this region. If you seek to explore the unexplored in your discovery for a world unknown, then join us for the venture of a lifetime. Pokhara is 200 kilometers from Kathmandu. After having morning breakfast in Kathmandu, we take a scenic drive to Pokhara that takes approx. six to seven hours. Drive through the Prithvi Highway following the river bank of Trishuli and Marshyangdi. 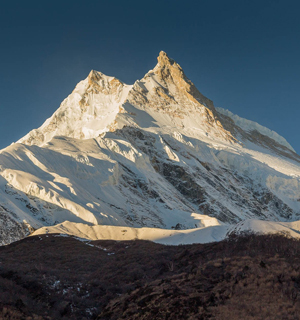 If the weather is clear, we will have plenty of opportunities on the way to witness some of the beautiful peaks including Ganesh Himal, Annapurna, and Manaslu. Once we reach in Pokhara, we check-in to the hotel nearby lakeside. Stay overnight in a hotel. Take a short scenic flight (about 20 minutes) Jomsom from Pokhara. 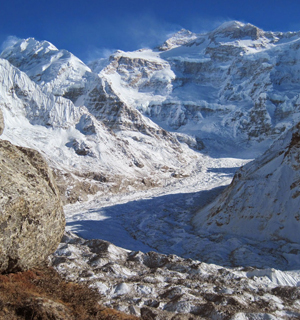 The flight will offer you to witness the deepest river-gorge in the world at Kaligandaki. After landing at Jomsom airport starts the actual trek. Following the east bank of Kali Gandaki rive to Ekle Bhatti, we walk for another half an hour to reach Kagbeni. Kagbeni is an oasis like settlement consisting of flat-roofed houses. You can visit a Tibetan Buddhist Gompa there while enjoying the superb views of Mount Dhaulagiri, Annapurna, Nilgiri, and Mount Tilicho. Stay overnight at hotel. Today, after having the morning breakfast, we take a short walk through a narrow flagstone-paved path. We then enter to the restricted area of Mustang. Continuing our walk towards the east bank of Kali Gandaki, we pass by some impressive villages of Tangbe and Chhusang before we reach Chele. Stay overnight at a local guesthouse. We continue our trek from Chele today and after 45 minutes of our walk; you can see some good views of the Kaligandaki valley back down with some impressive sights of Mount Nilgiri and Tilicho Peak. It takes another one and half hours to reach Dajori La Pass and we reach at Samar, really a picturesque village in the region. From Samar, we continue to walk through the center of the village and descend to a stream where we can witness eroded watercourse. Ascending up and continuing to cross Bhena La and Yamda La Passes, we now make our way to Syangboche village following different mani walls and stupas. Shortly, we arrive at the village of Geling, where you can visit a couple of ancient Buddhist gompas. Stay overnight at a local guesthouse. 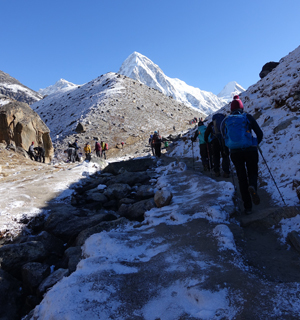 From Geling, we climb a steep uphill trail and continue walking to a pass at 4025m. The pass offers the beautiful views of Annapurna range. After the pass, we descend down to Ghemi, a small village with few teahouses. From Ghemi, we continue towards a stream and cross a suspension bridge which makes our way up to upper valley. Upper valley offers you the longest mani wall in the Mustang region. We follow the route beside the mani wall and climb another pass of Charang La to eventually reach Charnag, which is the old capital of Mustang. Stay overnight at a local guesthouse. It's going to be the final destination of our trek today. As we are going to walk towards Lo Manthang from Charang, it's going to be relatively short and moderate walk as well. Following the Charang river to the north and then gradually climbing up to the Lo La pass, we can enjoy the panoramic views of Lo-Manthang and Upper Mustang. After the pass, we take an easy downhill walk towards Lo-Manthang, an ancient walled city, the capital of Mustang. Stay overnight at a local guesthouse. Today is the exploration day at Lo-Manthang. Go for walking tour around the valley. You can visit four major gompas that date back to the early 15th century. Excursion to Loori Gimpa, Tang, Sukhad, Yaradhara, Sarad, Chhongdup, and Tinkar will be a good option for you today. Stay overnight at a local guesthouse. Stroll the way back to Ghami today via Gekar today. It takes around six hours to reach Ghami. Stay overnight at a local guesthouse. Stroll the same way back to Samar. Stay overnight at a local guesthouse. Trek the same way back to Kagbeni today. Stay overnight at a local guesthouse. 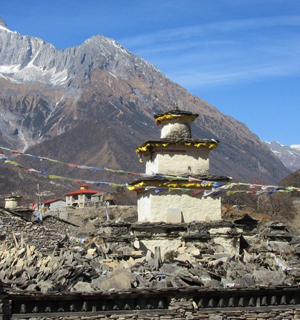 It takes only a couple of hours to reach Jomsom from Kagbeni. So, you can start late today. Stay overnight at a local guesthouse. After having your morning breakfast, catch your early morning flight to Pokhara from Jomsom. On the remaining time, you can take the sightseeing tour of Pokhara city. Enjoy boating at Phewa Lake, visit Mahendra Cave, Bat's Cave, and Davis Falls. If you wish, you can go for shopping in Pokhara. Stay overnight at a hotel. Drive back to Kathmandu from Pokhara today. And join the farewell dinner with our team. Why Mountaineering in Nepal ? Let's start your Himalayan Holiday. With the dedicated support of a strong, efficient and highly committed team, Encounters Nepal has become a name to be reckoned with in the paradigms of pure adventure.